Before joining ochs und junior in 2013, I worked in Silicon Valley on the Google user experience research team. 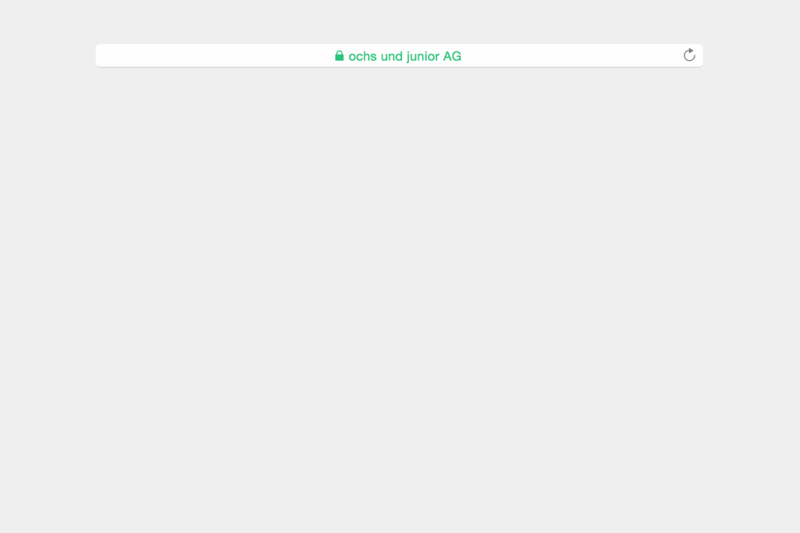 User experience is equally essential for ochs und junior, since our website is the primary way our clients discover us. We do no advertising, and do not increase the cost of our watches with a printed catalog. I would like to shine a light on three aspects of our user experience that are in the background. The first has to do with security, and the second two have to do with speed. Speed is critical for ochsundjunior.swiss, since we use higher-resolution watch photos than any watch site we know of. Most of our photos are 3198px wide (beyond Retina resolution), to support zooming in your web browser and on touch devices like iPad. ochsundjunior.swiss is a secure website. This is symbolized by the green “lock” icon in your web browser’s address bar. This lock means there is an encrypted connection between your web browser and ochs und junior’s web server, and no third parties are able to “listen in” on their conversation. We are on the leading edge of internet security. We use an Extended Validation SSL certificate (that is why you see our full company name, ochs und junior AG, and not just a green lock), something only 10.3% of the top 1 million secure websites have done. We even use HTTP Strict Transport Security, something only 4.3% of the top 1 million secure sites have done (statistics from the Trustworthy Internet Movement). We do not sell watches via ecommerce. Each sale is handled through direct, personal communication with cofounder Beat Weinmann over email, the phone, or Skype. The primary reason we went the extra mile to make our site so secure is because we believe any information you submit to us should be safe and private (for example your email address during newsletter signup, or your name and address when contacting Beat Weinmann in the customizer tool). The second reason we made ochsundjunior.swiss secure is speed. Our secure site enables us to take advantage of SPDY, a highly efficient network transfer protocol developed by Google. Only secure websites are able to use SPDY, though most secure websites do not (only 8.4% of the top 1 million secure sites have implemented SPDY). With SPDY, web pages load faster, even accounting for the added overhead of making a secure connection. Google uses the SPDY protocol, as do other performance-focused Silicon Valley companies like Dropbox, Twitter and Facebook. To my knowledge, ochs und junior is the only watch company in the world to make use of the SPDY protocol. You can test sites for SPDY support using SPDYCheck.org. We sell approximately 150 watches per year to clients in over 20 countries. To make sure our website loads fast wherever our clients access it, we use a high-performance content delivery network. It employs 62 data centers in major cities around the world (check out the network map to identify the data center closest to you). This means whichever country you visit ochsundjunior.swiss from, you are connecting to a local data center for the majority of your web browser’s requests, which significantly reduces overall page load time and latency. Enjoy browsing our secure, SPDY, locally-served site!